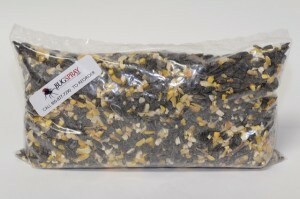 PRODUCT DESCRIPTION: One pound of specially selected mixed seed. The seed has been chosen for it's unique properties to drive rodents, squirrels, chipmunks crazy. A secret scent has been added that sets this seed apart from traditional bird seed. When used in conjunction with Pecan Paste(825328) and Night Flyer Trailing Scent(825318) you will have a combination that is irresistible to target animals. RATE OF APPLICATION: This will vary depending on the target animal. 4oz per set would be more than enough for rodents including squirrels, chipmunks and rats. For use with large multiple catch bird traps, 16oz for prebaiting and each set would be just about right. Good mix, chipmunks love it.